If it repeatedly returns to a nominal 1V+ you could calculate an internal impedance from equilibrium current. My head hurts just thinking about that. This AM's read is 1.54V. The fact that it is holding voltage over days, sounds more like a battery than capacitor, but surely non-linear discharge characteristic so ignore my ohms law musings. It's interesting many are calling it "battery action". I'm surprised some of the bigger manufacturers, of cap types where DA is more pronounced, haven't written more about the mechanisms involved. It would be nice to be able to model it better. The "battery" comment was a joke in light of Wayne's battery faucets. The basic mechanism for DA is pretty well understood ( a distributed capacitance with series resistance between capacitive nodes). Different capacitors using different internal mechanical construction will behave differently in this regard. I suspect the bounce back observed by Wayne is a combination of high internal impedance, and non-linear discharge characteristic. I suspect the modern low ESR capacitors will also have less DA due to much lower internal impedances. I've shared this story before but the last time I looked into DA seriously was back in the 70's in connection with the (2) phono preamp stages in my disco mixer kit (1978). The very old school IC phono preamp used a 22uF electrolytic in series with a 360 ohm resistor for the gain leg LF pole. While that RC should be well out of the picture for most of the audio bandpass of interest, I was able to determine that the aluminum cap was causing tens of degrees phase shift at 20kHz. I had some nice 22uF tantalum caps laying around and their superior ESL reeled in that phase shift. I mailed replacement caps to about 20 of my DJ kit builders and asked them to swap out the caps and give me their subjective impressions about sound quality. One actually well known (audiophile) live sound engineer, who apparently had a kit, returned the tantalum caps and decided to do me a favor and advised me that "everybody knows tantalum caps have horrible DA". DA mainly only has an effect when caps are charged and discharged with different impedances (like sample and hold circuits, or sidechain time constant circuits). For my old preamp I gladly embraced the lower phase error in top octaves. Since then I avoid using electrolytic capacitors in any audible frequency poles, but not because of DA. Trying to get the models perfect in the simulations is a big topic of discussion where I work, ie power conversion, not audio. Though even the grizzled old engineers, aware of the effect, haven't made much of a fuss about it. When I've noticed the effect in the lab, hv dc power supply filter caps, the output impedance is so high I haven't been able to get the "battery" to do any appreciable work. It did definitely left me wondering though. I have trouble imagining it being very significant, if even audible, in real world apps unless the DC is a problem, as mentioned earlier, when the cap gets switched into play. In my searches it seemed as if most are using simple linear model to characterize it which hasn't seemed very satisfying. Then I found this paper, and see now that more complex models have indeed been proposed: https://cdr.lib.unc.edu/indexableconten ... 62c379949c It was new info for me that I found interesting. This is a great thread which piqued my curiosity enough and caused me to do some google searching. Joke? What's that? It went straight over my head. The model I use for audio analysis is C with series of smaller RCs in parallel. Avoiding electrolytics to make in-band audio poles will negate any impact. 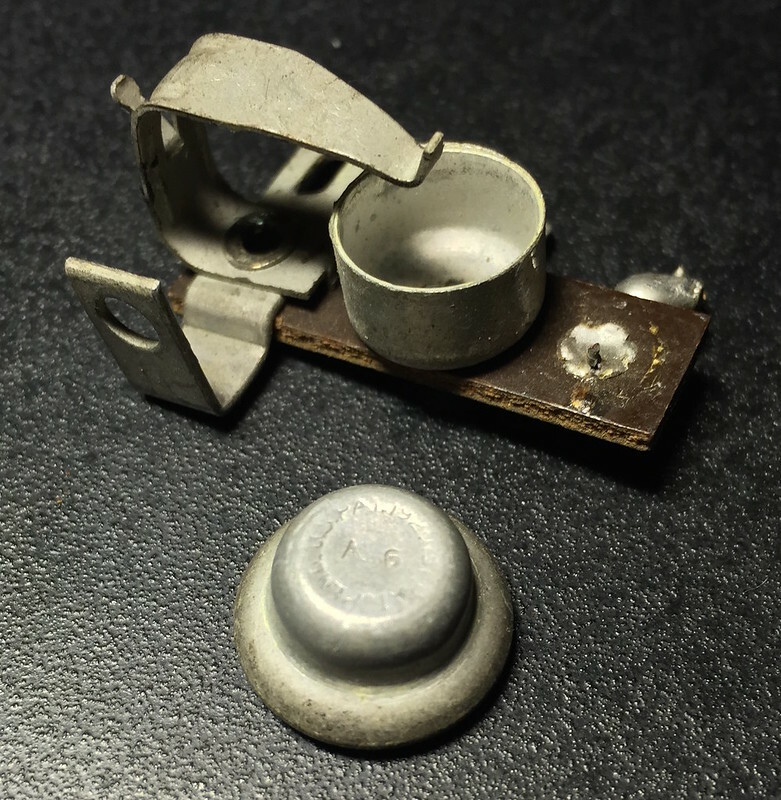 In the 90s, my hamfest tool kit contained a 9V battery and a simple DMM to characterize unknown film caps found in the wild. The basic procedure was to charge the unknown cap for five counts, short it for one count, and then measure the recovery voltage. After some training with known samples, the measured recovery voltage could reliably identify the dielectric of a film cap, adding another data point as to whether I needed to buy the caps or skip them. Nice to see that someone tarted the procedure up with complex exponentials! Found the Mallory grid bias cell and holder. I get a brief 0.3-0.4V reading. 2M4 DCR and climbing. I don't trust those readings. There was a type of grid bias battery used in the 1930's that looks a lot like a hearing aid battery, clipped in near the tube cathode. I found one awhile back, and it still has a charge. Is the Mallory cell in series with the cathode or in series with the grid? I saw in the application circuit it in series with the grid but IIRC you mentioned it connected to the cathode. And another weird thing relating to "battery action." 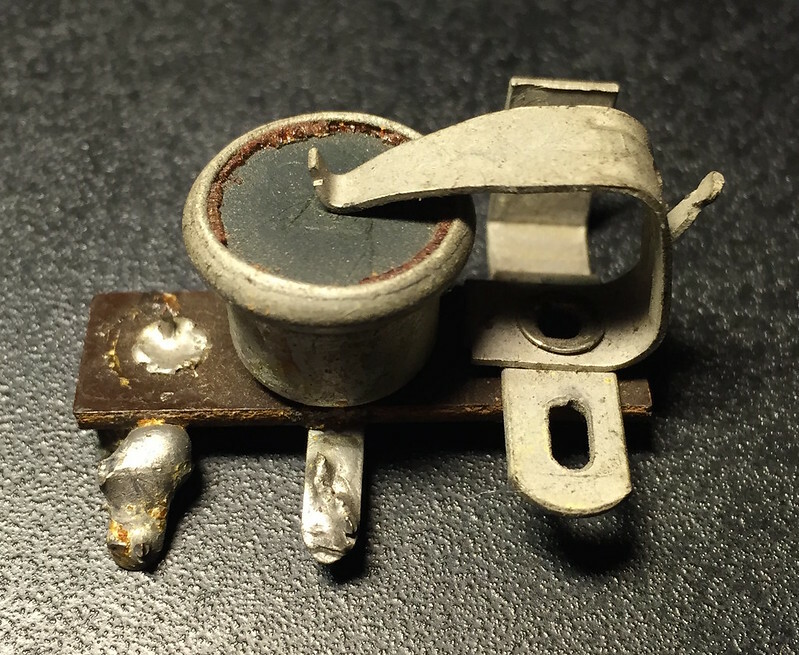 In the Entropy thread where I replace my motherboard capacitors (See: viewtopic.php?f=11&t=406&start=440#p11240) I also change the very old, almost dead, coin cell batteries. How the CMOS kept its memory I have no idea. Most of these CR2032 3.2V batteries measured less than 1.2V "open circuit." What was odd is that they measured differently depending on the polarity connection of the meter. I repeated this with multiple DVMs and all were slightly different depending on polarity of the meter. New batteries measured identically regardless of the meter connections. My hunch is that the Thevenin equivalent of the old batteries is extremely high compared to new ones and the source impedance is interacting with the meter unpredictably. Why the various meters measure differently with the battery based on their lead polarity remains a mystery.